- Andrew Jackson, 17th President of the United States, was one of the country's more colorful presidents. He took the oath of office in 1829 with a saber slash scar on his forehead and two bullets embedded in his body. One bullet lodged near his heart and came from a duel with Charles Dickinson whom Jackson killed in the duel. This picture was taken at President's Park near Williamsburg Virginia. 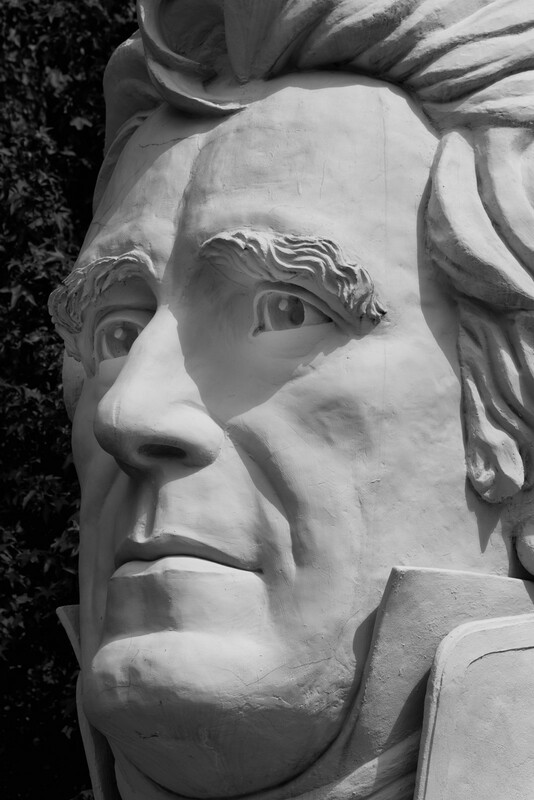 The park is a collection of giant 18 foot tall busts of the first 43 presidents. The park is reported to be closing at the end of the month so we paid a visit today. It was pretty surreal. Canon 7D, 1/1600 sec @ f/4.p0, ISO 100, 80mm focal length, converted to Black & with with Silver Efex Pro.